You always amaze me with your beautiful outfits and pictures. I love this look and the vest is gorgeous! 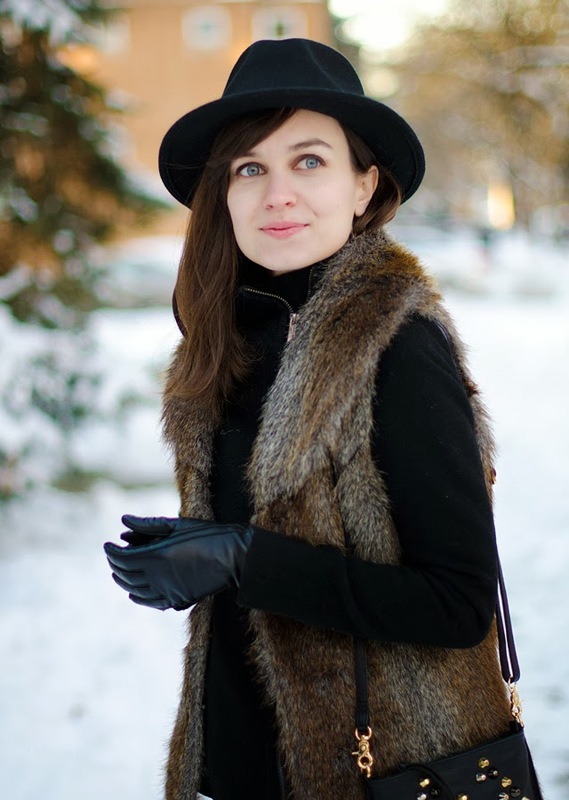 I've been looking for a faux-fur vest (for a great price too) like yours, which is discrete and chic. You look SO beautiful in these pictures! Your blue eyes are really gorgeous and your complexion is flawless. Hi Kristina, I bought the grey sweater I'm wearing on my current post about 3 weeks ago and it cost 19.99! Great deal, isn't it? It's so warm and the texture is really beautiful. Last Saturday I went to Marshalls because my mom loved this sweater too (I sent her a picture of the sweater before I wore it) and she wanted to buy one for her. Unfortunately, there was only one in small and her size is large, but I will go there again soon because many times I bought something that was not available in my mom's size and later I found it in her size. If you want me to check out to see if the small one is still available, I would do it and we could arrange by e-mail how I could ship it to you. My size is extra small and the small one is not much larger than the XS. Oh, Lu, it's so incredibly sweet of you to offer this! I appreciate it so much! But something tells me a small might be a bit too big for me, and I don't want you to go through all this trouble of having to ship it to me. I'm really touched by you wanting to help though. Thank you so much! I will check out a few Marshalls locations here in Chicago, but it's no big deal if I don't find it. I'm sure I'll come across something similar sooner or later. I am loving that fur vest! I wanted one so badly last season but tried about half a dozen vests that all failed for me. I know what you mean, Lisa. I stayed away from fur for a long time. Since kindergarten to be exact. I think I might have been traumatized by having to wear a giant faux fur coat that not only made me look like a stuffed bear, but also prevented me from playing with other kids, since I simply couldn't move in that darn thing. It's so incredibly difficult to find fur (real or faux) that wouldn't add tens of pounds to your frame and make you look like Chewbacca. I've seen so many fur vests, but your styling and pictures inspire me to get one. Just lovely! I recently joined your site. Your pictures and choices speak to me. Thank you so much Ann! I hope you find a perfect one!